Annan Athletic consolidated their position in the play off zone with a narrow but well deserved victory over promotion candidates Elgin City. It was a match where Annan where in total control for large spells in the game but their failure to take the numerous chances from some excellent attacking play which came their way throughout the match ensured Elgin were always in with a chance of grabbing a point. Annan boss Jim Chapman was forced to make one change from the Montrose match with the suspended Darren Ramsay’s position at the centre of midfield being taken by Barry Cuddihy and with Smart Osadolor unavailable his position on the bench was taken up by Steven Black. Elgin City were still without the SPFL’S top scorer and influential player Shane Sutherland and Christopher Dodd. Annan made their intentions clear from the start with their open attacking play a constant threat to a City team who appeared to lack the conviction which has taken them to within touching distance at the top of the league. Max Wright had a couple of early efforts which tested keeper Cammy McKay before Elgin forced their first corner in the 10th minute when Mark Nicholson headed past the post. Rabin Omar created a golden opportunity moments later when he shrugged off the attentions of his marker to get behind the defender to finish with a low shot which went narrowly past the keepers right hand post. It was a scare for the visitors but it was a trend which became apparent throughout the game. Omar was then upended 25 yards out but Jordan Stewart’s free kick sailed over the bar. 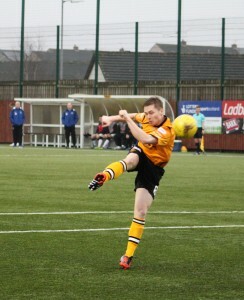 Blair Currie was then called into action to deal with a Thomas Reilly effort in the 16th minute but minutes later Annan won a penalty when David McKenna finished a penetrating run down the right and his cross was handled by Mark Nicholson and McKenna converted the spot kick to give Annan the lead. Rabin Omar then squandered a golden opportunity to double Annan’s lead in the 35th minute when his shot struck the outside of the post from 7 yards after he won his way into a promising position. Annan were playing some attractive football and in the 40th minute Barry Cuddihy could consider himself to be unfortunate when his quick thinking 40 yard effort bounced over the bar as keeper Cammy McKay was left stranded after clearing another Annan opening on the edge of his box. Elgin were then dealt a bit of fortune at the start of the second half when Peter Weatherson’s goal was chalked offside after Cuddihy’s through ball sent the Annan striker clean through on goal. It appeared to be a debatable decision from the stand side linesman. Annan continued to create openings and a delicate chip by Weatherson into the path of Barry Cuddihy should have reaped a second goal but Cuddihy’s well struck effort narrowly went over the bar. Archie McPhee’s free kick in the 64th minute sailed over the bar as Elgin tried to get back into the game but Annan maintained their attacking play down the left where Nathan Flanagan was increasingly becoming a thorn in the side of Elgin team where his penetrating runs were creating openings and when Rabin Omar had the ball in the net in the 75th minute he was booked for handling the ball into the net. It appeared Omar did not know much about it as the ball came back off him and into the net. Annan continued to take the game to Elgin with Flanagan sending over a low inviting cross which Omar only just failed to connect with. The visitors started to enjoy more of the ball as game entered the final 5 minutes of the game but they were unable to penetrate the well organised Annan defence and in the end Annan deservedly lifted the points which keeps their play off hopes alive and pushes them into third spot for at least a few days till Elgin play their mid week match down at Cowdenbeath. This was another important victory for Annan which keeps their push for a play off place firmly within their own hands with 8 games to go. Next Saturday Annan make the trip to Stirling Albion. ANNAN ATHLETIC: Blair Currie, Jean Guy Lucas, Jordan Stewart, Raffi Krissian, Steven Swinglehurst, Gavin Skelton, Max Wright, Barry Cuddihy, Rabin Omar (Aiden Smith 80 min), David McKenna (Peter Weatherson 37 min), Nathan Flanagan. Subs not used : Alex Mitchell, Stephen Bronsky, Callum Home, Steven Black, Tom Fry. ELGIN CITY : Marc Waters, Mathew Cooper , Darryl McHardy, Mark Nicholson, David Brownlie, Thomas Reilly , Archie McPhee, Brian Cameron, Chris McLeish (Kieron Stewart), Craig Gunn (Robbie Bruce 80 min), Daniel Moore (Ally Sutherland 54 min). Subs not used : Mark Walters, Shane Sutherland, Scott Smith. REFEREE: Greg Aitken. ASSISTANTS Stephen Hodge and George Calder .